Fuse and GRID 2 hit the PS Store this evening as full PS3 titles, though for those looking to pick up cheaper PSN titles Mountain Crime: Requital gets a fresh release, and Wolfenstein 3D gets a re-release. You can check out Rockstar Games’ classic PS2 beat-em-up based on The Warriors as well. 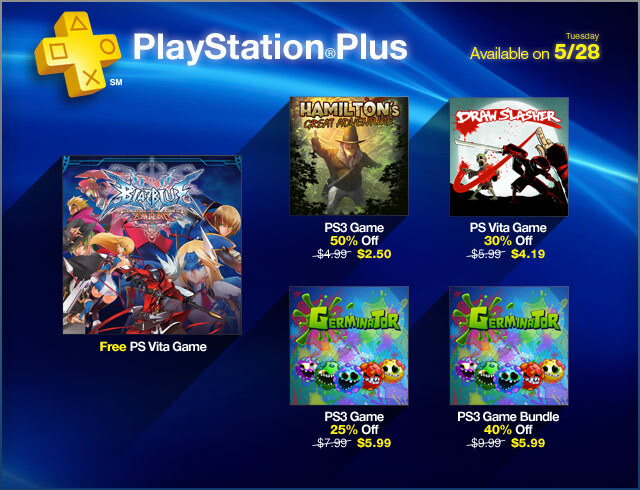 Remember, PlayStation Plus subscribers get BlazBlue: Continuum Shift Extend for the PS Vita for free starting today. The Soul Sacrifice free DLC is available to download too. Abandoned cities reclaimed by nature. A population decimated by a modern plague. Survivors are killing each other for food, weapons; whatever they can get their hands on. Joel, a brutal survivor, and Ellie, a brave young teenage girl who is wise beyond her years, must work together if they hope to survive their journey across the US. Download The Last of Us Pre-Order Bundle which includes the full game, PSN Pre-Order Theme, and Sights & Sounds Pack. Be fast, be first and be famous as you join the elite in ‘World Series Racing’ where the greatest cars, drivers and events come together in the search for a new motorsport icon. Experience aggressive racing against advanced AI and become immersed in the race with GRID 2’s new TrueFeel Handling system which powers edge-of-control exhilaration behind the wheel of every iconic car. An extensive, separate online campaign powered by RaceNet sets new standards in the genre. Welcome back to racing. Someone is killing the guests at a mountain resort, and you could be next if you don’t solve the mystery at the heart of this chilling adventure! Question guests, search for clues and escape a noose that tightens with your discovery of each new body. Along the way, one question will weigh heavily on your mind: Why did one of the victims claim you are the killer? Become an Imaginstruments virtuoso and start making music with your PS Vita. Mix drums, melodies and bass sounds, add effects and change the key and tempo of your tracks, all in real-time and on-the-go.